Avoiding artificial ingredients and overly processed dog foods and treats can be a matter of preference on your part or due to your pup struggling with allergies and intolerances. Either way, it can be hard to find what you’re looking for! We’ve tracked down the options and reviewed our favorites available on the market of natural and organic dog treats. Before you “go fetch” the reviews, check out these features to consider when you’re looking for some tasty treats. Weight: You can use the weight of different treat options to compare value across different recipes and brands. Ingredient: Beef, fish, and variety recipes are a few examples of the main ingredients you can find in natural dog treats. Grain Free: Many of these treats use holistic ingredients, but some dogs need to eat grain free--or their owners prefer it! Texture: Soft, crunchy, and chewy are the main textures to consider. Dogs with dental issues may prefer moist, soft treats. Type: Whether your dog wants a snack, a training reward, or a stick to chew, different treat types have different appeal. Food Standard: The dog treats on our list are all natural and have organic ingredients, but we’ll let you know if it’s USDA certified organic. Now it’s time for the reviews! Our top pick and budget pick summarize two amazing options in the world of organic and natural dog treats. If you’re not convinced they’re perfect for your pup, keep reading! There’s a lot more out there for you to consider. Let’s get into some reviews! If you’re looking for the best organic dog treats for a dog that loves to chew, your search ends here! 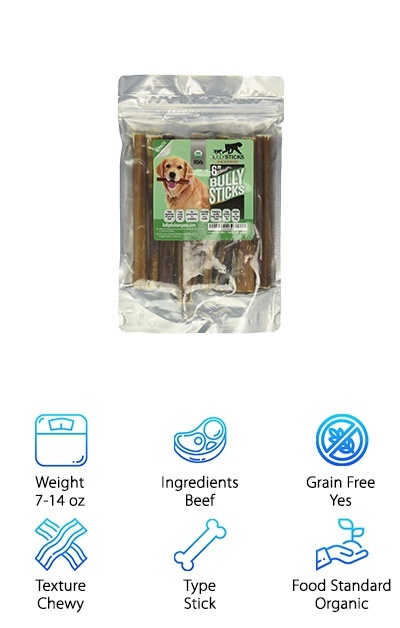 Made from 100% free-range, grass-fed beef, these bully sticks are USDA certified organic and FDA-approved. The sticks come in 6’’ and 12’’ lengths to suit a variety of dog breeds and sizes. These high-protein chew sticks are a great alternative to rawhide and bone, keeping your dog occupied with a delicious beefy smell and flavor. Like with any chew, keep an eye on your dog while they’re chewing it and limit their intake to one bully stick a day. No preservatives or artificial ingredients--just beef. 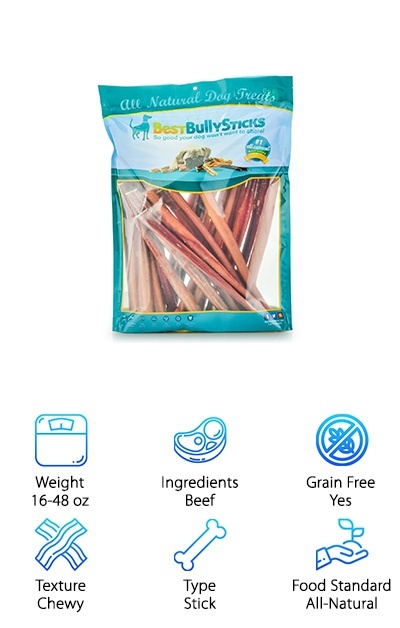 These bully sticks make a great treat for dogs with allergies to grains like corn, or common protein sources like chicken. Not sure this is the best option for your pup? Keep reading to discover a variety of all-natural treats! Wellness Core is a great source for your new favorite organic dog treat option! These bite-size crunchy baked treats are grain-free with a core of real marrow. The biscuits come in recipes like Beef and Turkey, and they’re all-natural: no artificial colors, flavors, or preservatives. Wellness Core Marrow Roasts work well for rewards during training or as a “just-because” snack or treat. If your dog has a sensitivity to wheat, corn, or other ingredients but loves biscuit dog treats, the Marrow Roasts give them the best of both worlds! These treats work well for any breed size or age. The wholesome, holistic ingredients make these a worry-free choice even for dogs that don’t have food allergies. 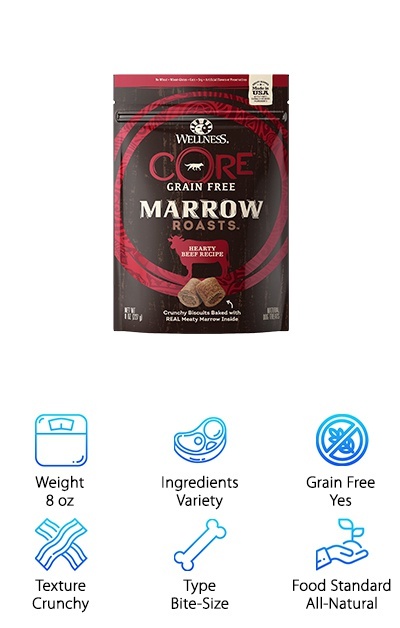 And for considerate owners that want to give their dog high-quality treats without breaking the bank, the Marrow Biscuits and other treat options from Wellness Core are one of the best options out there! Best Bully Sticks All-Natural Chews are made from 100% free-range, grass-fed beef. They come in 6’’ and 12’’ lengths to suit different dog breeds and sizes. These are about as close as you can get to organic dog bones without raising your own livestock! The chews are made from beef, not rawhide or bone, so they’re easy to digest. This high-protein, grain-free snack is a great way to keep your dog happily occupied! The tough, stick-shaped treat is just beef, no preservatives or other additives. Dogs that have sensitive stomachs can enjoy a bully stick without worrying about artificial additives or grains. Like all chew treats, supervise your dog while they’re chewing and only give them one bully stick a day. Since they’re all-natural, they have a smell that your dog will enjoy--but you might not! Chewers, teethers, and more will love gnawing on these bully sticks for hours on end. 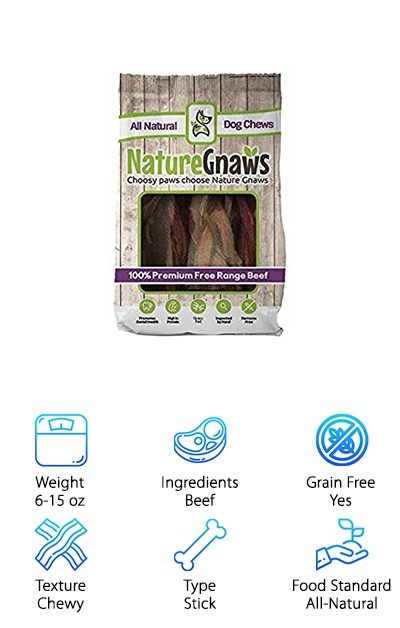 Although not officially certified organic treats, Nature Gnaws bully sticks are about as natural as it gets, made from 100% free-range grass-fed beef. They come in a range of sizes to suit different dog breeds, from 2-4’’ sticks up to 11-12’’ sticks. This non-rawhide chew is high-protein and easy to digest. It’s designed to keep your dog occupied for a long time, so they’re a great way to reward your dog for time spent in the kennel or traveling. These treats have a hard texture and a tasty beef flavor, so they’re great for dogs that love to chew. If your pup has sensitive teeth or other dental issues, a softer treat may be a better option. From teething puppies to adult dogs who still love a good long chew, the Nature Gnaws provide total satisfaction! A busy dog is a happy dog, and these long-lasting braided chews do the trick. Keep it simple? No problem! Plato Salmon Strips keep the ingredients list short with over 90% natural Pacific salmon as the main ingredient. The strips have a strong odor that makes them extra-appealing to most dogs--when it comes to canines, the stinkier, the better! The natural oils in these treats may not be carpet- or fabric-friendly. The treats have no artificial preservatives, corn, wheat, or soy and are lightly salted. These natural dog treats are made in the USA from farm-raised salmon. Salmon jerky can be a great way to get your dog’s attention during training or as a high-value reward. It’s also a great option for dogs with allergies to common protein sources like chicken. 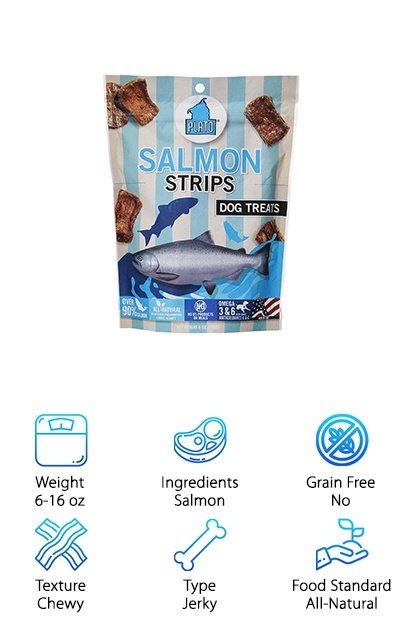 With 32% minimum crude protein content plus omega fatty acids from the salmon’s natural oils, your pup is getting a high-protein treat with some healthy benefits! If you’re looking for organic dog treats, Plato Pet Treats has some great options. If your dog is on a grain-free diet, Blue Wilderness Natural Biscuits make a great treat when he’s been a very good boy. These biscuits come in exotic recipes like Bayou Biscuits, which are made with alligator and catfish! All of the formulas are grain-free with no poultry by-product meals or artificial colors, flavors, and preservatives. If you’re looking for a protein-rich treat for training or “just because,” these biscuits have 17% minimum protein for a truly meaty crunch. Other recipes include Denali Salmon & Venison Biscuits, Rocky Mountain Recipe with Red Meat, and Trail Treat recipes with Duck, Salmon, and Turkey. Dogs that have grain sensitivities or other allergies to common dog food ingredients will love these oven-baked dog treats. They make a great snack, or break them up into pieces for training treats! You can switch up the flavors periodically if your dog tends to get bored of the same treat every time. 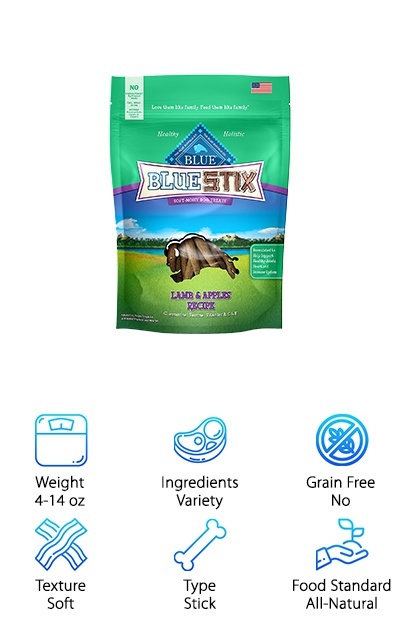 BLUE Stix are the perfect all natural dog treats for canines that love soft, meaty treats. The moisture in the treats helps make them nice and stinky, which dogs love! They’re also fortified with vitamins, antioxidants, and omega fatty acids, so they’re not just a treat! They even have glucosamine and chondroitin to support joint health! The variety of recipes lets you pick and choose your dog’s favorites, like Lamb & Apple, Beef & Potato, Chicken & Brown Rice, and Salmon & Potato. If your dog has food allergies or sensitivities, BLUE makes it easier to work around those issues and keep your dog’s tail wagging! 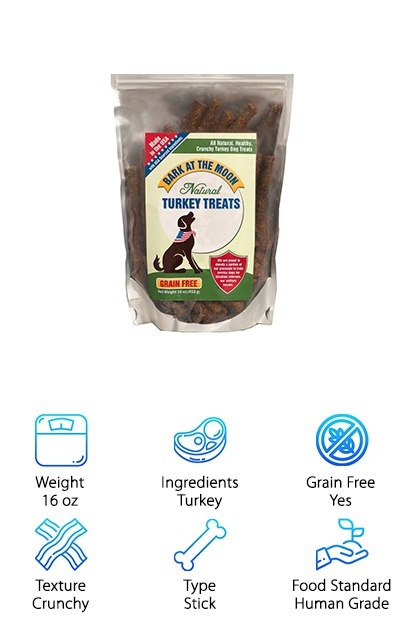 Whole meats and vegetables with no corn, wheat, soy, or artificial additives for color or flavor make these treats a great choice for just about any dog. The soft sticks can be broken into pieces or given whole depending on the size of the dog. 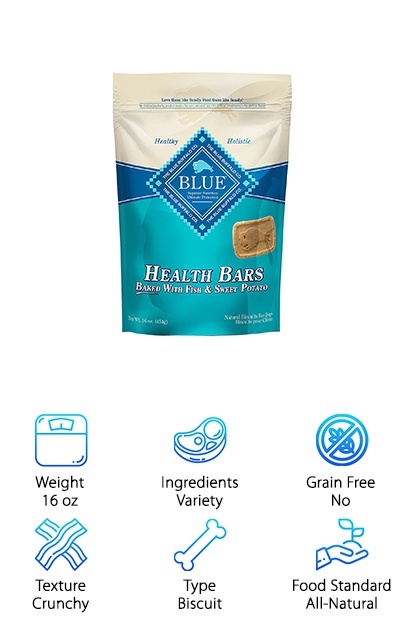 BLUE Health Bars are oven-baked dog biscuits made with natural holistic ingredients plus antioxidants and omega fatty acids for a healthy boost. Choose from recipes like Apple & Yogurt, Fish & Sweet Potato, Bacon Egg & Cheese, Banana & Yogurt, Chicken Liver, or Pumpkin & Cinnamon. The many recipes let you customize your dog’s treats to their diet and preferences or switch it up if they tend to get bored with the same flavor. These natural dog treats use whole grains and vegetables, but never corn, wheat, or soy. If your dog has a food sensitivity, avoiding common ingredients like corn and soy can be difficult. But you can reward your dog with BLUE Health Bars without worrying about things like artificial colors, flavors, or preservatives. The whole biscuits are the perfect size for medium to large dogs, and you can break them apart for smaller breeds! Made in the USA, the Green Butterfly Crunchy Turkey Sticks are grain-free and made from 100% human grade natural ingredients with no artificial colors, flavors, or preservatives. Made simply with just six ingredients plus in-season vegetables like peas and carrots, you can give your dog the crunchy treats they love in a minimally processed way. If you’re looking for a natural chewy dog treat, these may not be your best option. They’re crispy but can be broken apart easily, so they won’t keep your pup occupied for long! You can break them up into pieces to make smaller treats for training or for smaller dogs and puppies. These simple and delicious treats don’t use added salt or sugar--so your dog gets all of the flavor without any filler! If your dog has sensitive teeth or dental pain, you may want to offer them some moist, soft treats instead. 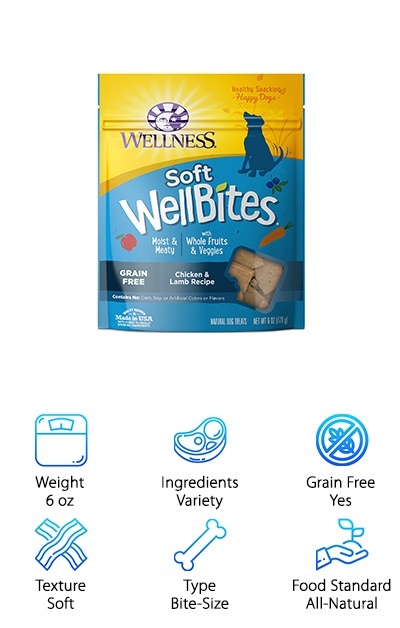 Wellness Natural Pet Food Soft WellBites come in a variety of flavors. Try out a single six-ounce bag or order one of each flavor in a variety-pack to try them all! The flavor options include Beef & Turkey, Chicken & Lamb, Lamb & Venison, Chicken & Venison, Lamb & Salmon, and Turkey & Duck. These recipes are grain free and made with all-natural ingredients. They can make great training treats--break them up into pieces or feed whole if your pup has been a particularly good boy! The soft texture works well for older dogs or dogs with dental pain or missing teeth. The moisture makes them “stinkier,” which dogs love! With no corn, soy, artificial colors, or artificial flavors, your pup can get a tasty treat that’s still good for them! Wellness Natural also makes dog foods, too, so if you’re already a fan, you may want to try out their treats, too!